Storms this afternoon sitting on Castle Hill. Some nice thunder and lightning but I did not chase due to traffic! Nice cracks of thunder at times! Good to see a storm in central Sydney for a change! 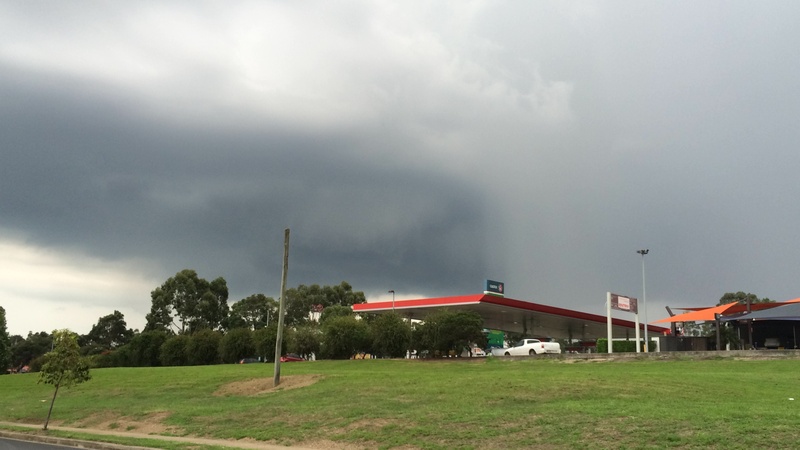 I left work at 4.15 pm and went to the Auburn City Council car park to take some photos of the storm cell approaching from the west. Some interesting cloud structure including strong updraft towers observed to the west. Some good cloud to ground lightning strikes observed. Earlier in the day I took some photos of developing storms and cumulonimbus cloud towers from the car park roof looking to the west. The car park roof offers excellent views of storms across Sydney. Looking west, I was able to watch the storm develop. Despite the presence of the large anvil shield, the updraft towers marking the storm core was readily visible. The one shown in the photo did produce some cloud to ground lightning strikes. There was another storm cell to the south but I decided not to photograph that due mainly to poorer light and the inability to obtain good quality photos. With the storm reaching the intensity as shown in the photo, I left the roof of the car park and decided to try a local chase through peak hour traffic. I drove along Parramatta Road then NW to Baulkham Hills along James Ruse Drive. Surprisingly I managed to drive into moderate to heavy rain during my travels and the traffic was not as bad as expected. Interestingly very heavy rain occurred around Northmead and water was observed flowing over the road. Amazing no rain had fallen at Glenwood at the time. Looking at the rainfall for Sydney, a fall of 36 mm fell around Northmead with 22 mm near Toongabbie. Blacktown had roughly 6 mm. The storms were hit and miss with some localities receiving large totals while others received little. I drove to Bella Vista where I filmed / photographed some lightning with good success. During my travels I passed through a set of traffic lights that had been blacked out and I noted upon my return home that a power failure had occurred where I live. It is understood from reading the newspapers that a man in Baulkham Hills was struck by lightning but survived. I noted the storm cells were splitting or having short life spans and by sundown, all the storm activity had ceased.